That papier-mache figure I saw at the end of my run on Saturday? Its owners tweeted today that it has been stolen. I *thought* it was odd that it was all alone with no-one in sight, but I guess they thought no-one would steal something so big. Has anyone seen our giant Regency gentleman? He was stolen after the Children's Parade on Saturday. Same Sky need your help to get him back! 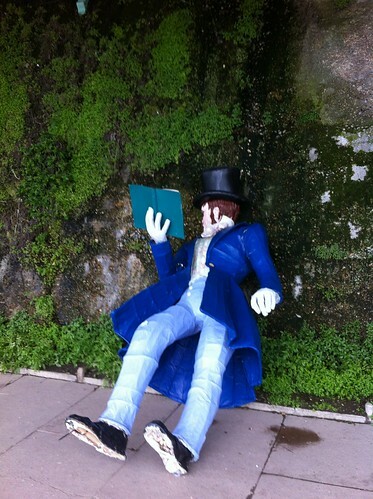 The 3-meter high figure, named “Percy”, is holding a book and wearing full regency dress, including a waistcoat made from a map of the world, and a top hat. Percy was made by Same Sky community artist, Jo Coles, especially for the Children’s Parade. Jo spent two weeks making him from willow sticks, newsprint and domestic paint. He was taken from underneath the Arches on Madeira Drive as our crew were clearing up after the parade. Did anyone see him (or maybe even photograph him) being taken? I told them when I'd spotted him and got the reply: We are on the trail. We have a spotting of him in Coldean on late Saturday afternoon. Meanwhile, the sign that normally hangs outside Kemptown's art deco teashop, Metro Deco, has also gone missing, as also announced by tweet. I can only suspect a lonely, tea-drinking giant. Better jokes welcome.